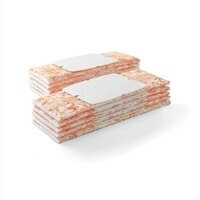 iRobot Braava jet Damp Sweeping Pads - Pad - for robotic floor cleaner - orange (pack of 10) - for Braava jet 240Braava jet™ Damp Sweeping Pads gently clean everyday dust and dirt with a water-activated cleaning agent, leaving a fresh, clean scent. Box of 10 Cleaning Pads. Braava jet™ Damp Sweeping Pads gently clean everyday dust and dirt with a water-activated cleaning agent, leaving a fresh, clean scent. Box of 10 Cleaning Pads.